Circle of Love Stampin Up Blog Candy!! 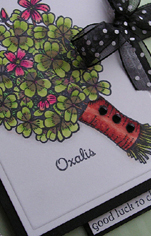 Today over on the Flourishes Blog is my second post as their February Limelight Designer! I’ve been playing with their beautiful “Irish Blessing” set. Hope you’ll join me. Happy Crafting! neat cards, like the wrapping on the second one, I can only imagine how fun that is to try and stamp on a circle like that! Had to check your cards out on the blog, but come here to comment. Got to say what you did with those sentiments is outstanding! I really love the second card, especially. So well done. Really amazing work, Susan! What a great card. Love your coloring.